As a social business, or a social media professional you understand the importance of staying on top of today’s rapidly changing media landscape. But what about the rest of your team? Education plays a key role in maintaining a competitive advantage in social business. So while your company’s visionaries are focusing on social strategy, there is a need for current, tactical content and support for those executing the social vision. HootSuite University is here to help, and happy to release the Introduction to Social Media Across An Organization. Available to all HootSuite University students, this courseware is part one of a two-part series, and will provide the fundamental education needed to get your entire organization on the same page about social media. Students will explore how marketing teams are using social media, and how different departments are leveraging social in order to accomplish company goals, whether it’s marketing, sales, or customer service. 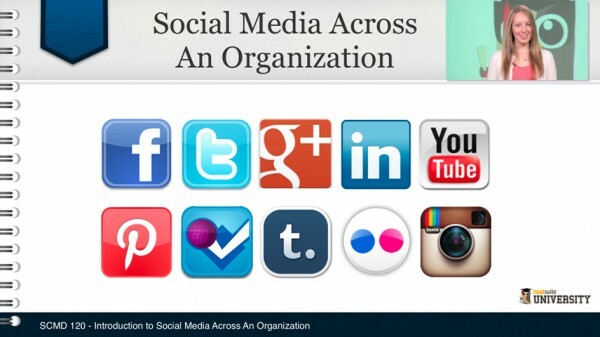 Discover what social media is, who’s using it, and why it’s important for your organization. Check out the courseware curriculum and get a sneak peek of what you can expect. Part two of this foundational courseware, available in June,will introduce and explore the landscape of social media by providing a profile of the mainstream channels, as well as many of the more niche platforms. Don’t bore your teams with endless slides and a monotone speaker. Enable and empower them with HootSuite University’s industry-leading approach to online education, through engaging video modules, useful worksheets and online tests. HootSuite University’s growing library of social media content provides ongoing education for your teams, including our Lecture Series featuring industry leaders, and cutting edge courseware.